The Hallettsville ISD parent survey is now open for parents to provide valuable feedback on how our schools are doing and what can be done to improve our campuses and departments. The survey will be available until April 22, 2019, at 4:00 pm and can also be accessed through the campus and district websites. Once surveys are compiled, the information will be returned to each principal and reviewed with the campus advisory council during the months of April and May to determine campus and district goals and priorities for the 2019-2020 school year. The results will be used as part of a comprehensive needs assessment required for our federal funding application, and some parent responses will also be used for the House Bill 5 Community and Student Engagement Evaluation for 2018-2019. 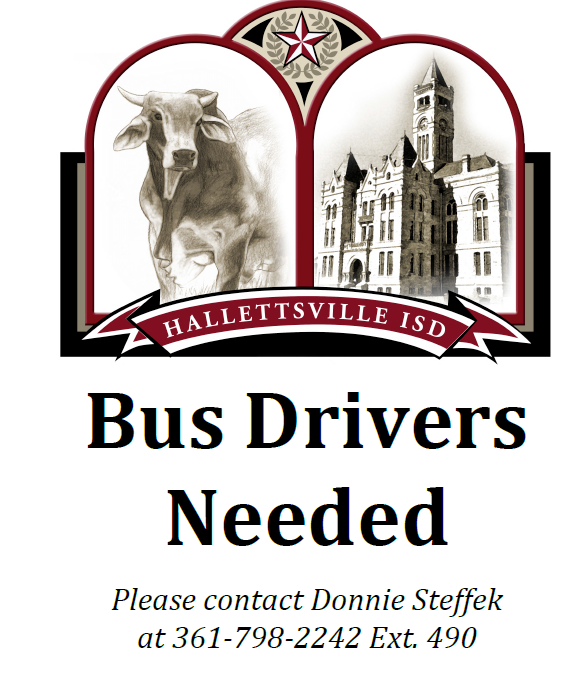 Parents are asked to complete a separate survey for each child being served in the Hallettsville Independent School district. Thank you for your time and constructive feedback! Athletic Physicals are scheduled for April 30th! It is mandatory that all students in this year's 6th, 8th and 10th grades have a physical in order to participate in HISD sports programs for next year. Physicals are good for 2 years. If the student athlete is not sure if they have a physical on file, have him/her have one done. Physicals povided on April 30th at HISD are FREE! All students are encouraged to get a physical especially if they have had a serious injury last year. The Clinic will charge $50 after this date. The expense is NOT covered through the different medical program. The Hallettsville ISD Board of Trustees have approved a revised policy affecting all non-district student transfer requests. Transfer applications will only be accepted from March 1 through April 30 for the 2019-2020 school year. No applications will be accepted outside this window. Applications are available from the school office. 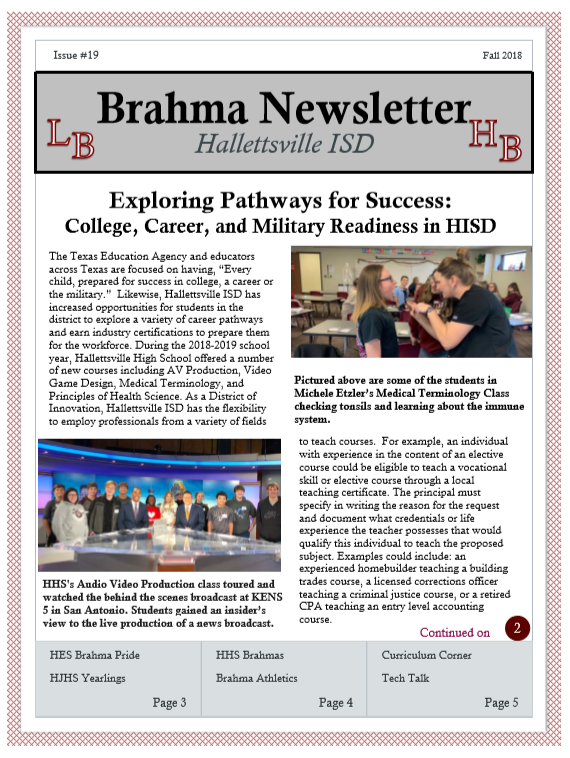 HES Fall 2018 Newsletter is now available! Parental & Family Engagement CONNECTION is now available. The August/September newsletter, The Parental & Family Engagement CONNECTION, is available in English and Spanish and now Vietnamese, http://www.esc16.net/page/title1swi.3_newsletter%20-%20Copy . Order a Football Field Paver or reserve a spot on the Granite Wall to honor your student, a graduating senior, a former student, or a supporter of Hallettsville schools! Click here to see what is new with Accelerated Reader!